The first horse races in Mülheim were held on harvested fields and were internal competitions of an agricultural association founded in 1863. In 1885 a riding club was founded, which later became the Mülheim Racing Association Raffelberg. The first race took place in the Haagerfeld, a vicinity in the city district Broich. The association grew from year to year. In 1888, the first "real" race day, officially announced in Germany's racing calendar, took place on the Schönnenbeck Meadows on the lower Aktienstraße. From 1893 on, the Kleinkemm Meadows in Saarn on the left bank of the Ruhr opposite the Kahlenberg was the venue for the horse races. 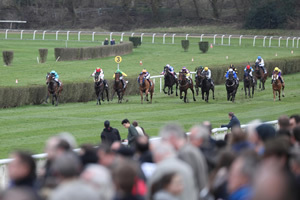 There was an increased interest in horse racing in Mülheim from now on. The race days became popular meeting places for officers and "lord riders." During this period, Mülheim dignitaries such as August Thyssen and Hugo Stinnes joined the association; its chairman was Lord Mayor von Bock and Polach. Large numbers of spectators visited the races in those days, some of whom arrived by tram and steamboat. AIn the long run, however, the racecourse in Saarn did not allow for any further development. Because it was pastureland residing in floodplain, the racecourse was oftentimes not in very good condition and the construction of solid facilities was not possible. Therefore, in 1909, the riding club Mülheim joined forces with the racing club Duisburg to move its racecourse from Saarn to Speldorf. In 1910, a racecourse was completed at Raffelberg, which was meeting all requirements. There were flat and obstacle courses, grandstands, a technical building, a totalisator building for horse betting, horse shelters, a beer and a music booth. 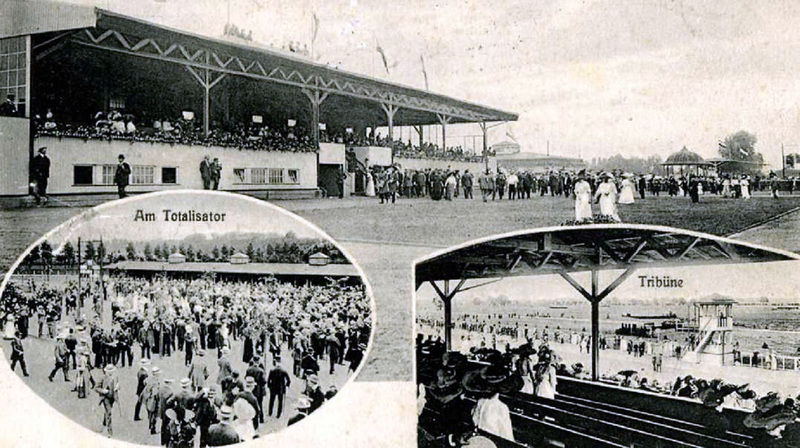 The new Raffelberg racecourse was opened on 29 September 1910, and this first race day drew a large crowd of visitors. In fine autumn weather numerous tramcars, carriages and automobiles drove to Raffelberg, many visitors also came on foot. The grandstands were crowded; the best seats had been sold out for a long time. Perfect visibility as well as the layout of the racetrack and the buildings were generally praised, and were also very well received by the trade press. The following years were a time of growing success for the track. However, this great epoch of equestrian sport in Mülheim suddenly came to an end with the beginning of WW I. The First World War did not bring any destruction, but in 1918 the stands burned down. It was not until 1920 that races could be held again. Unfortunately, the grandstand was destroyed by fire again in 1928, which caused the racing club considerable difficulties. With the purchase of the racetrack area, the city of Mülheim guaranteed the continued existence of equestrian sport at Raffelberg. In the 1930s, the racecourse resumed its successful development. Although the beginning of WW II brought considerable restrictions, races were still held until 1942. Then the track suffered severe damage by air strikes on Duisburg and Mülheim. The stables were also hit, and many horses were killed. The remaining horses were then moved to different location. When the Americans invaded Mülheim in 1945, the track was in a very bad condition. Besides suffering from air strikes, it had also been hit by plundering at the end of the war. But soon the reconstruction began. Already in summer 1945 a public trainer returned to Raffelberg with his horses. Since there was no railway yet, he covered the way from Düsseldorf to Mülheim on foot with his horses. Now the process of rebuilding began. Members of the club worked tirelessly to restore the track to a usable condition. As early as May 1946, the facilities were in such good condition that British soldiers were able to hold a race. In October 1946, the Racing Club Mülheim-Duisburg Raffelberg elected its first post-war executive committee with Oberstadtdirektor Josef Poell (president), Oberhausen's Oberstadtdirektor Georg Kaeßler and the factory owners C. A. Schaumann, Wilhelm Tholl (all deputies). Following the election of the new board of directors, the first race day after the war took place on October 27, 1946. On September 2, 1947 the association was renamed in Mülheim-Duisburger Rennverein Raffelberg (Mülheim, Duisburg, Oberhausen). The following years brought a great upswing in horse racing at Raffelberg. The new managing director Karl-Heinz Busch succeeded to bring the "Preis der Diana," the prestigious German Oaks, to Mülheim. Raffelberg was now one of Germany's leading racecourses with many annual events. 1949 belonged again to Busch, who intended to move Mülheim to the top of German horse racing. 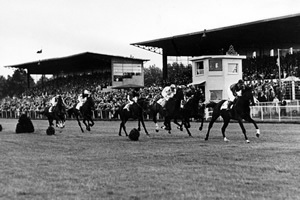 In addition to the "Silbernes Band der Ruhr," the German Oaks, the "Westdeutsche Hürdenrennen" as well as and the "Preis der Stadt Mülheim," along with the winter races traditionally held at Raffelberg, Busch managed to turn the "Goldene Peitsche" into a popular public festival. The two races "Orakel der Zweijährigen" and "Orakel der Dreijährigen" were added in 1950. In December 1953, Oberstadtdirektor Bernhard Witthaus was elected chair and Erich Seeger was made honorary managing director. The following years were marked by heavy economising, until the financial downturn was passed in 1958. That same year, it was decided to change the name. Since the cities of Duisburg and Oberhausen, which had previously been included in the name, shared only limited financial responsibility, the name has since been: Mülheimer Rennverein Raffelberg. Starting in 1959, the best two-year-old German filly was crowned at Raffelberg in the "Preis der Winterkönigin." This race developed into one of the most valuable tests for two-year-olds offered on German racecourses. Ankerkette with Hein Bollow in the saddle made history when she became the first winner of this race. In March 1960, the committee announced the renovation of the track at the annual general meeting. This had become a necessary measure since torrential rain and the clogging of the sewer system had caused the racecourse area to be flooded in September. This happened again in the spring of 1961, so that the German Oaks had to be moved to Krefeld. Thriftiness continued to be a priority for the board elected in April 1961. That is why the German Oaks were decided for the last time in Mülheim in 1962. When in 1963 the filly Allerbeste was the only horse nominated for the Orakel der Zweijährigen, the race was taken out of the program. Oberstadtdirektor Heinz Heiderhoff took over the chairmanship of the racing club June 4, 1967. The English champion jockey Lester Pigott wins the German Oaks with On Dit. Racetrack TVs are introduced at the Raffelberg racecourse. Stadtsparkasse Mülheim appeared as a sponsor for the first time in a race named after it. Prize money offered exceeded the one million mark for the first time in 1972. 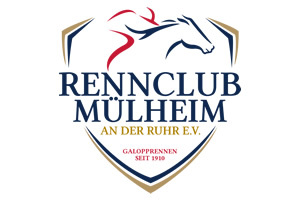 The racing club Mülheimer broke through a significant barrier for the first time: With an amount of DM1,114,435 a seven-figure betting turnover was achieved for the first time in the club's history. With the ground breaking ceremony, Lord Mayor Dieter aus dem Siepen initiated the extensive reconstruction work on the racecourse grounds, financially supported by the state and the municipality that extending into the summer of 1980. 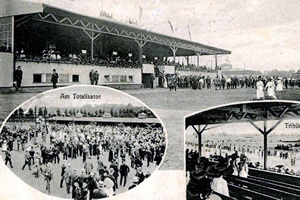 The old totalisator buildings were replaced by new ones, an indoor riding arena was built next to the parade ring. Chief city director Heinz Hager assumed the duties of the president. In August 1980 the electronic totalisator was used for the first time. 142 terminals ensured that betting operations run smoothly, even at major events. On March 1, 1982, a hurricane uprooted several old trees, severely damaged the balance building, again making renovation work necessary. In April 1989 the main wing of Michael Trybuhl's stable burned to the ground and had to be rebuilt. At the end of 1989, Stall Diana was inaugurated Gestüt Auenquelle with 50 box stalls with Uwe Ostmann as the responsible trainer. Opening of the new all-weather indoor grandstand I. The costs amounted to approx. DM 1,300,000. No more winter races at Mülheim Raffelberg; from now on, these are held in Dortmund and Neuss between November and February. Heinz Hager, who has chaired the racing club since 1980, handed over the chairmanship to Bodo Scheibel, member of the executive board of Sparkasse Mülheim an der Ruhr. Opening of the golf course in the track area. In the summer of 2003, Mayoress Dagmar Mühlenfeld took over as chair of the Mülheimer Rennverein Raffelberg e.V., thus continuing a great tradition. She headed the club until the end of November 2006 during which time the Raffelberg facility was continuously improved and expanded under her leadership. The average attendance of over 5,000 visitors was only one proof. The association goes on consolidation course under the new chair. 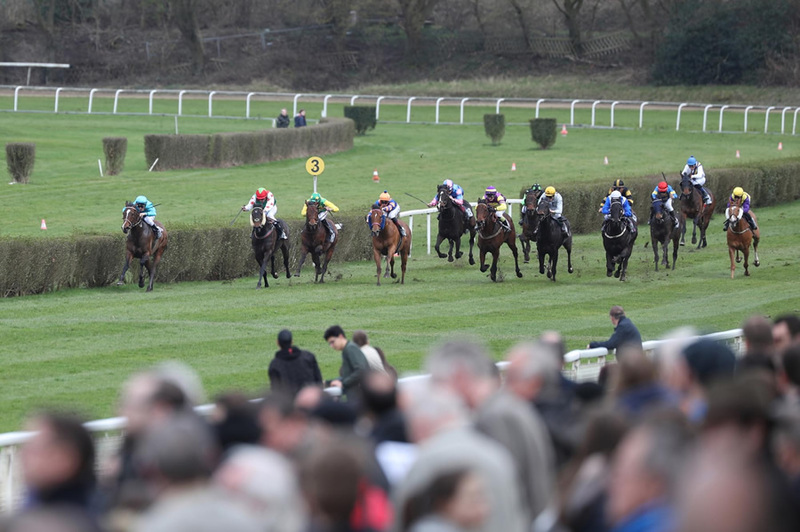 The feature races at Mülheim Raffelberg, the "Preis der Diana" (German Oaks) and the "Preis der Winterkönigin" (Champion2yo race for fillies), were sold for cost reasons and left Raffelberg. 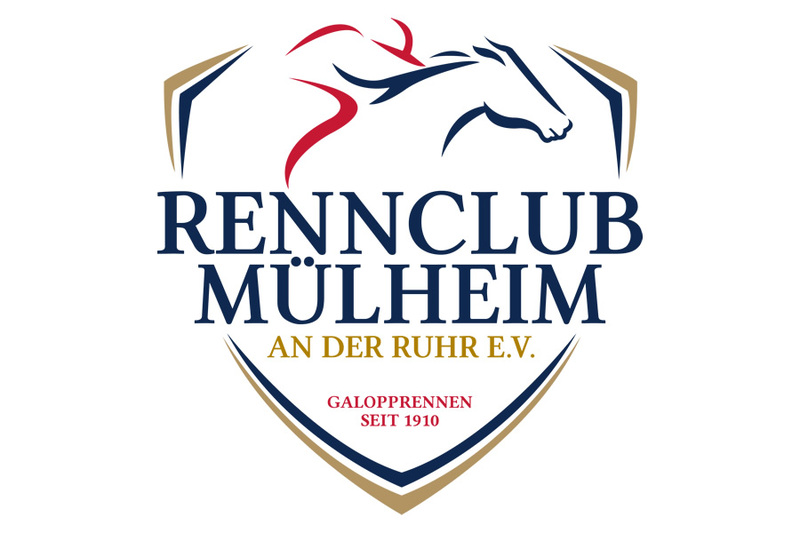 The racing club's lease agreement with the city of Mülheim an der Ruhr was converted into a heritable lease agreement. The owner of the golf course Ralf Schmitz became vice chairman of the racing club. At the end of 2006, a new board was elected around chairman Hans-Martin Schlebusch, as well as Susanne Schmitz-Abshagen and Joachim Orilski. 2007 public trainer Werner Baltromei and lawyer Dirk von Mitzlaff joined the board. Ralf Schmitz was made honorary managing director of the racing club. Only 3 race days were held in the season. With Ralf Schmitz, the board of the racing club expanded to 5 members. 100 years of horse racing at Mülheim Raffelberg. 4 race days were held in the anniversary year. The board of the racing club decided to close the training centre and to hold only 3 race days every year. After resistance by members of the racing club and the founding of an action group, things seem to improve again at Raffelberg. Despite the preservation of liquidity by the governing body, the racing club's remaining board members Hans-Martin Schlebusch and Ralf Schmitz surprisingly reported that the club had gone into insolvency. The Rennclub Mülheim an der Ruhr e.V. was founded by 14 friends of horse racing. Karl-Dieter Ellerbracke (chair), Dr. Michael Bergmann, Hans Bierkämper, Günther Gudert and Werner Krüger (vice chair) were elected to the board. With the approval of the politics of the city of Mülheim, the insolvency administrator of the "old racing club" handed over the facility to the newly founded racing club. Implementing an existing concept and business plan, the new racing club has since then begun to refurbish the facility. With an existing concept and a business plan, the new racing club began to put the facility into shape. More than 120,000 euros have since been invested in the plant in a very short time. The first race day of the new Rennclub Mülheim an der Ruhr e.V. took place on Tuesday after Easter.